Whoa – 100 days of development under my belt! Kind of a brief entry this one – I thought I was done with adding extra gameplay stuff for the alpha but watching my son play the game I realised there were a few things that were a little unclear. The main one was the location of ammo stashes. It’s really annoying when you run out of ammo (I’m still not 100% sure that I shouldn’t give the base weapon unlimited ammo) and sometimes, in the heat of battle, it’s hard to locate the nearest ammo cache onscreen or on the scanner. This is even more of an issue since I added enemy bones which clutter up the battlefield. So I’ve added two new features to make it easier to locate ammo, shields and rocket pickups – I call these ‘pickup detectors’ and ‘pickup indicators’. A ‘pickup indicator’ simply indicates the location of the nearest onscreen stash – they don’t appear if the user’s ammo, rockets or shields are maxxed out. Implementing these was fairly straightforward, though I did have a few issues getting the indicator to move nicely between two different stashes. In the end I settled on having the indicator ‘pop out’ and then ‘pop in’ again when the location of the nearest stash changes. In my libraries I have a method that allows one to set a ‘timed event’ on a particular sprite, this is an event that doesn’t get triggered until a certain amount of frames later. This functionality has proved extremely useful for this type of thing. A ‘pickup detector’ shows the closest route to the nearest stash if it is not onscreen. I settled on a simple arrow at the edges of the screen for this – not subtle but it works. As these would be annoying if they hung around all the time they only appear when the user’s shields or ammo are critically low. The rocket detector appears whenever a rocket pickup is present as these are pretty rare and you don’t want to miss them when they do appear. The ‘pickup detector’ was also pretty straightforward to implement – the most fiddly bit was getting the arrows to centre correctly depending on how many of them there are, even that wasn’t that much hassle though. I think these features make the game considerably more playable – plus I just love the look of that tiny pixel text! Please Sir – Where’s The Nearest Ammo Stash? I’ve always thought we should aspire to this ‘bubblewrap effect’ when designing games. 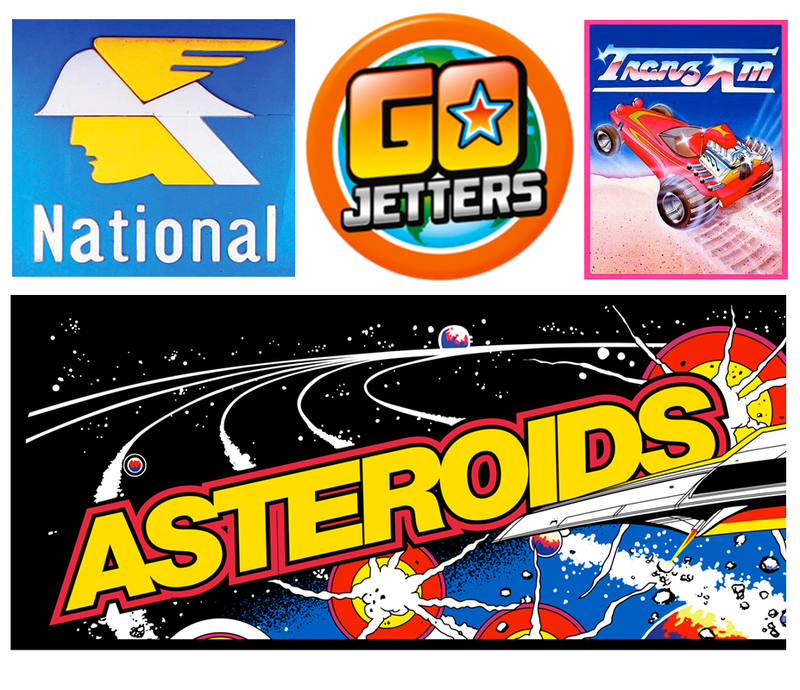 Most games, even the supposed AAA ones, comprise a fairly limited set of repetitive actions. If you can make those actions an enjoyable experience in and of themselves, regardless of gameplay, then you are onto a winner because no matter how good the player is at playing your game they will be having fun and come back for more. Recently I’ve seen this loosely referred to as ‘juice’ or ‘game feel’ but these terms are rather vague and are often used to refer to all sorts of things. I’m talking about something pretty specific here – make all your repetitive actions as ‘urgey’ as popping bubblewrap. Usually this is a combination of both visuals and audio. Now I’d already spent a lot of time on this stuff in Jetboard Joust but, whilst surfing GDC talks on YouTube, I came across this excellent talk by Jan Willem Nijman of Vlambeer on adding these types of elements to your game. I’d already implemented many of the techniques he talks about (camera shake, gun recoil, enemy and player knockback etc) but he made me rethink some aspects and put a bit more effort in to areas that were somewhat lacking. So – here’s what I’ve been working on as the result of @jwaaaap‘s talk. I already have some pretty hefty recoil on weapons but @jwaaaap suggests also recoiling the camera a certain amount when a weapon is fired. 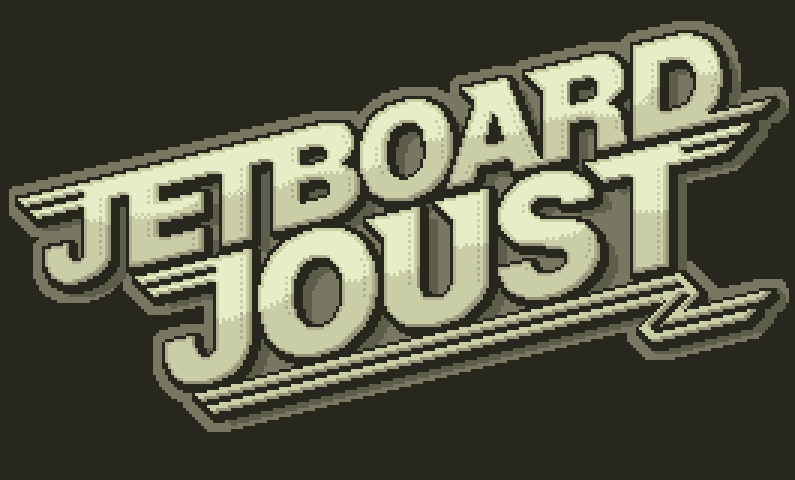 This didn’t make a massive difference in Jetboard Joust, probably because the camera is generally moving pretty fast anyway, but it is noticeable under some circumstances so I left it in. Adding a very slight delay when an enemy is destroyed adds to the ‘jolt’ effect and makes destroying enemies much more satisfying. It’s subtle but it works. I’m using a delay of 32ms. I had to be careful here to not implement the delay until the next frame (ensuring the first frame of the explosion is drawn before the delay occurs) and also to clamp the delay time so that destroying a bunch of enemies at the same time didn’t result in a massive delay. I also improved the first ‘flash’ frame of the explosion by adding a ‘threshold invert’ to my collision shader and making the circles that briefly appear larger, brighter and less pixelated. Enemies really look like they’re getting nuked now! I had been wanting to do something to make battles seem more ‘permanent’ for some time and @jwaaaap‘s talk was the kick up the arse I needed. I talk about adding smoke in my previous post but that’s still not really permanent so I also added bones that fall from enemies when they’re destroyed and collect on the ground as a permanent record of the carnage that’s ocurred there. Adding the bones was easy, the trouble started when I decided that they were too static and should react if the player hit the ground near them or crashed into a building that they were resting on. I didn’t want to run collision checking on every bone (there can be tons of them by the end of a level) so worked out a system whereby the world is divided into a series of overlapping ‘bone zones’. When a bone is static it is added to a zone and an entire zone can easily be discarded from the collision detection process in one go. I’ve used this approach before and it works well but I got myself into a bit of a flap with it here, plus it took a long time tweaking the various parameters so that the bones seemed to get disturbed by the correct amount. It still looks a little odd sometimes but its much better than having them totally static. I’d really like to add some permanent damage to the buildings but I haven’t yet figured out a way to do this that would be a) be cpu/memory efficient and b) not involve creating a load more pixel art. I will continue to give this some thought – it could be that I’m underestimating the memory available on modern devices as a spent so long developing for J2ME feature phones! My… What Big Bullets You Have! 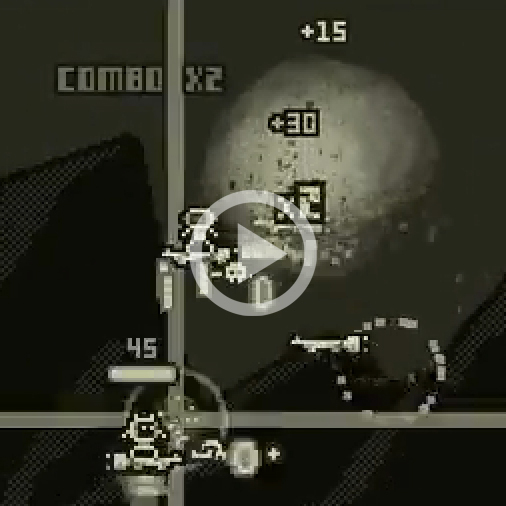 These Bullets Are Ridiculous – But Somehow They Work! Bone Bashing – A Stupid Detail That Caused Me Much Grief! 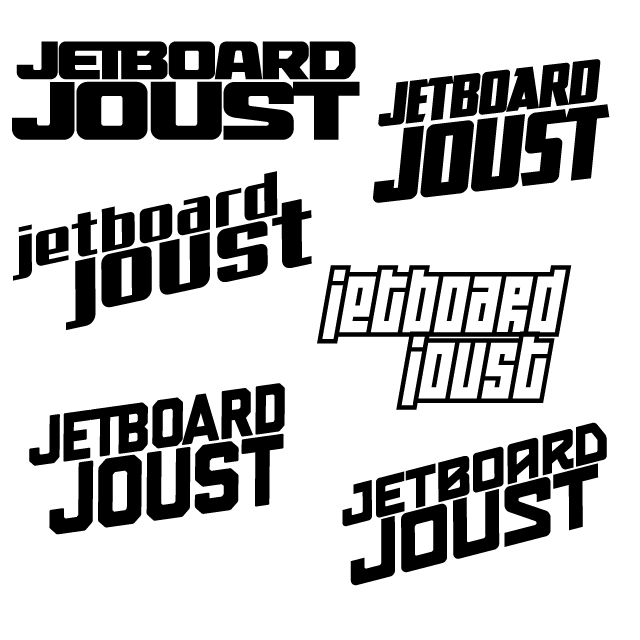 In the unlikely event that you’ve been reading this blog from the beginning you might remember that the camera in Jetboard Joust has always been something of a bugbear for me. Way back in the early stages of development I wasted countless hours trying to get a camera action that I was happy with but, after failing miserably (once I started to add enemies the camera tracking solution I described in the blog post above proved woefully inadequate), decided to go for the simplest solution of locking the camera to the player centre-screen and leaving it at that. Thing is – this kind of worked. Maybe because the camera is horizontal-only and the player’s horizontal motion smoothly accelerates and decelerates with no sudden changes? The game was perfectly playable and there were no sudden camera movements that looked out of place or anything. But… it was just a bit boring and I always thought I could make it better, so as I’m nearing ‘playable alpha’ stage I decide once more to revisit. I set up a separate ‘Camera’ class (rather than putting all the camera code in the main game class as I had before) and attempted to approach things a bit more methodically. Though it probably seems blindingly obvious I had a bit of an epiphany on realising that camera motion is really comprised of two separate elements, the camera target (ie what you want to be the centre of attention) and the way the camera moves to that target. I decided to tackle the camera motion itself first. Many online articles talk about Lerp smoothing as the de-facto way to deal with this so this seemed a good place to start. Rather than working with Lerp smoothing on the camera right away I tried applying it to some sprite motion so it was much easier to see what was going on. The results of this really require a separate post so I’ve explained the process in a small tutorial with some example code here. The net result was an extended Lerp class that moves an object smoothly towards a target no matter how often (and by how much) the target position changes. One of my main concerns about the camera being centred all the time was that, if the player was moving quickly, lookahead was limited to half the screen width. In ‘Defender’ (the main inspiration for Jetboard Joust) the camera seems to be focussed something like 25% of the screen width if front of the player so I started with similar approach. I took a maximum lookahead value, worked out the player’s current velocity relative to the maximum possible velocity, and then placed the camera target the same proportion of the maximum lookahead value in front of the player. For my second attempt I set up a variable that gradually increased/decreased in value depending on how long the player was travelling in a particular direction. So, from stationary, if the player was travelling left it would take approx five seconds for the value to reach -1.0 (the minimum possible) and the inverse for travelling right. I then multiplied the maximum lookahead value by this variable and set the camera target appropriately. If the player changes direction I set the variable to zero for a quick turnaround. This worked much better than my first attempt – the camera seemed to track fairly naturally with a long lookahead distance if the player was travelling any distance left and right and not switching erratically in the midst of battle. There were a couple of problems with this approach though, I didn’t like the obvious lag as the camera tried to ‘catch up’ with the player when accelerating from stationary and too often I’d end up forced to do battle at the edges of the screen. Firstly I tried positioning based on how many enemies were to the left or right of the player. So I’d start by dividing 1.0 by the number of enemies within range and then adding or subtracting this number to a variable based on whether each enemy was to the left or right of the player. The result was a number between -1.0 and 1.0 which gave an indication of where the action was relative to the player – this number was multiplied by the max lookahead value to give the camera target position. This time, based on the logic that 99% of the time the closest enemy would be the one the player was concentrating on in a dogfight I simply targeted the camera at the closest enemy to the player (whilst ensuring the player remained onscreen). The result of this was strangely compelling! Although the camera lurched left and right far too much it made the gameplay seem more intense, dynamic, and somehow just more ‘fun’. I was really surprised about how much the gameplay was enhanced by this simple approach – I just needed to find a way to tone it down a bit. So what I did next was use all of the above approaches and apply a weighting to each of them, hoping that this would provide some kind of ‘happy medium’. Fortunately, with a bit of tweaking, it did! I still felt I could improve things further though so I made this weighting dynamic. I fixed the weighting based on player velocity at 25% and based the remaining 75% on either the closest enemy (if any enemies are within range) or the directional duration. Another tweak I made was to slightly bias the ‘closest enemy’ calculation based on the direction the player is facing so that enemies in front of the player are considered ‘closer’ (I reduce the distance by 75%) than those behind. This makes the camera more likely to stick on enemy the player is currently engaged with. The result is a camera that doesn’t lag, gives a long lookahead if the player is covering a lot of distance (and no enemies are present), and pans to the centre of the action when a dogfight is in place. I think it works pretty well.